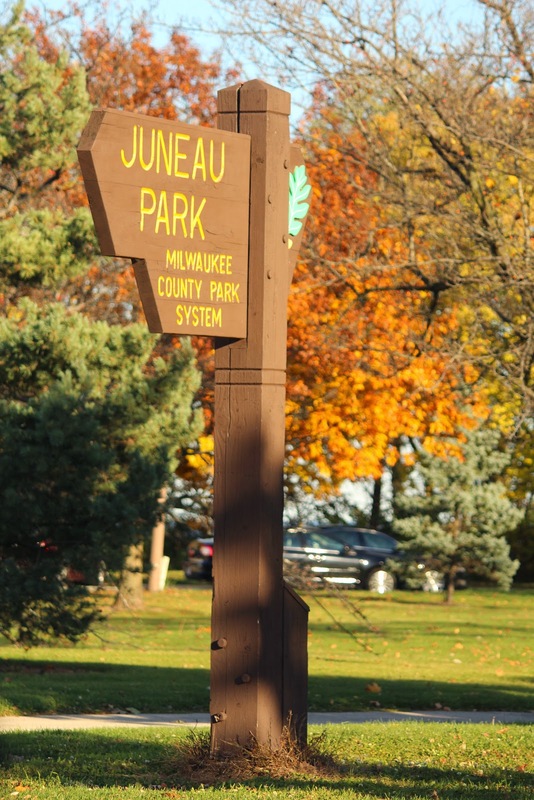 The monument is located at Juneau Park along the Oak Leaf Trail, Milwaukee, Wisconsin 53202. NOTE: The monument is accessible from northbound North Prospect Avenue / Wisconsin Route 32, just north of where it merges with East Kilbourn Avenue. There is plenty of parking on North Prospect Avenue; none next to the marker, but just a short walk from it. Horicon Argus. Wednesday, November 19, 1856. 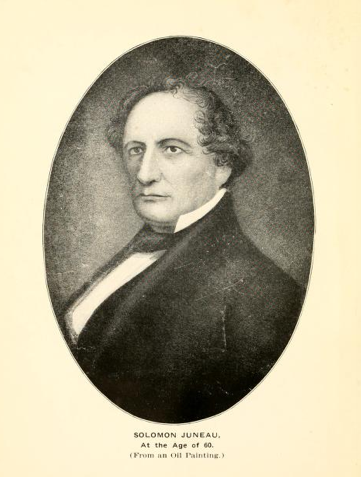 John P. Hobart, Editor. Death of Solomon Juneau. Looking west into downtown Milwaukee. The following content is in the public domain. UNVEILING OF THE JUNEAU MONUMENT. The site chosen for the statue is probably the finest in the city. 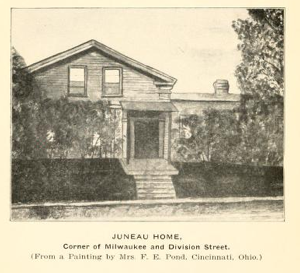 Standing upon the bluff, a hundred feet above the lake, it is visible far from land, and is so placed that viewed from almost any direction its bold outlines are projected against the sky, while from the pedestal there is an unbroken view of Juneau Park from its extreme limit to the depot at its southern end, and as extensive a vista of shore and terrace to the north. The monument stands on a solid foundation of stone sunk into the earth several feet below the frost line, and fitted to last for ages. The pedestal, classic in its order of architecture, is of red granite from the state of Maine. It is twelve feet square at the base, and eighteen feet, six inches in height. Upon the face of the second die and about eight feet from the ground, in bold, raised and polished letters, is the name SOLOMON JUNEAU. Upon the two remaining faces of the same die are two bronze bas-reliefs, representing episodes in the life of Juneau. The one upon the south side is an illustration of the inauguration of Juneau as mayor of the young city in 1846. Surrounded by prominent citizens, among whom there is seated at least one of the donors of the statue, the honored official is receiving an address of congratulation. The one upon the north side shows him standing upon the bank of the Milwaukee River. A group of Indians of both sexes surround him, some offering peltries, others engaged in the varied occupations of an Indian camp. 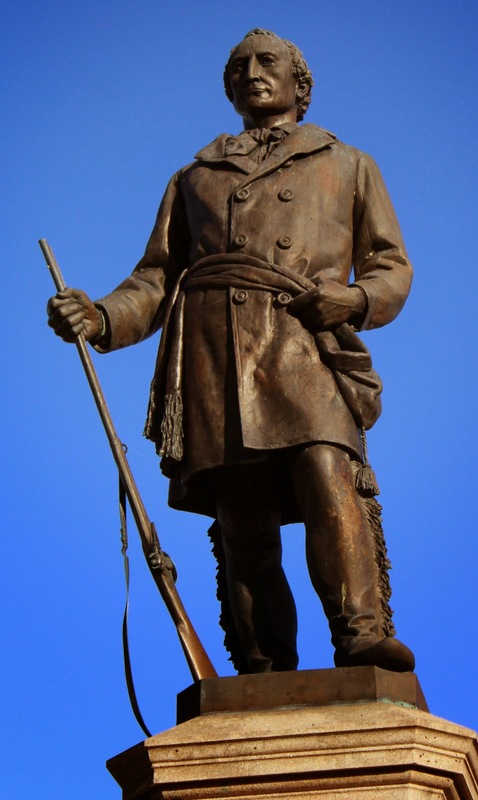 The statue itself is of heroic size -- thirteen feet six inches in height, and is most pleasing in effect. The features are calm, dignified and full of the benignity which was so marked a characteristic of the man. The figure is muscular and athletic, clad in the French Canadian costume that has been pronounced historically correct in every particular. The entire work is from the designs of Richard H. Park, of Florence, Italy, where, in the Royal Foundry and under his supervision, the bronzes were cast. 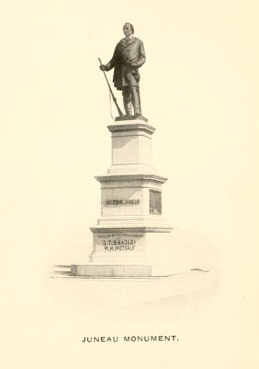 The pedestal, hewn from the quarries of Maine, was erected by and after the designs of the New England Monument Company, of New York City. 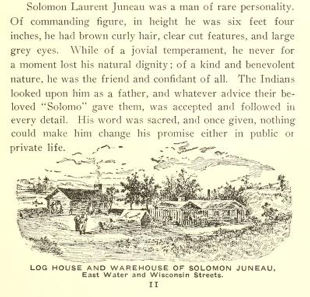 Solomon Laurent Juneau was a man of rare personality. Of commanding figure, in height he was six feet four inches, he had brown curly hair, clear cut features, and large grey eyes. While of a jovial temperament, he never for a moment lost his natural dignity; of a kind and benevolent nature, he was the friend and confidant of all. The Indians looked upon him as a father, and whatever advice their beloved "Solomon" gave them, was accepted and followed in every detail. His word was sacred, and once given, nothing could make him change his promise either in public or private life. Corner of Milwaukee and Division Street. The foregoing three screenshots are from content in the public domain. 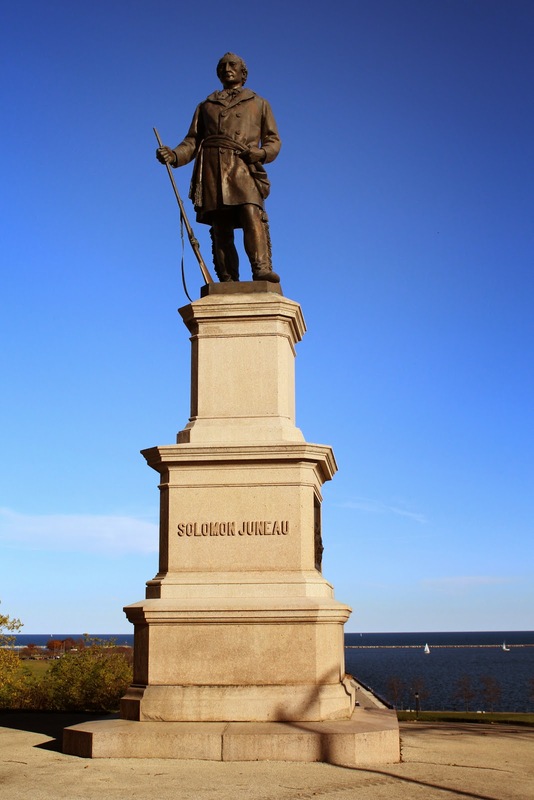 Photo of Solomon Juneau statue in Milwaukee, circa 1890. 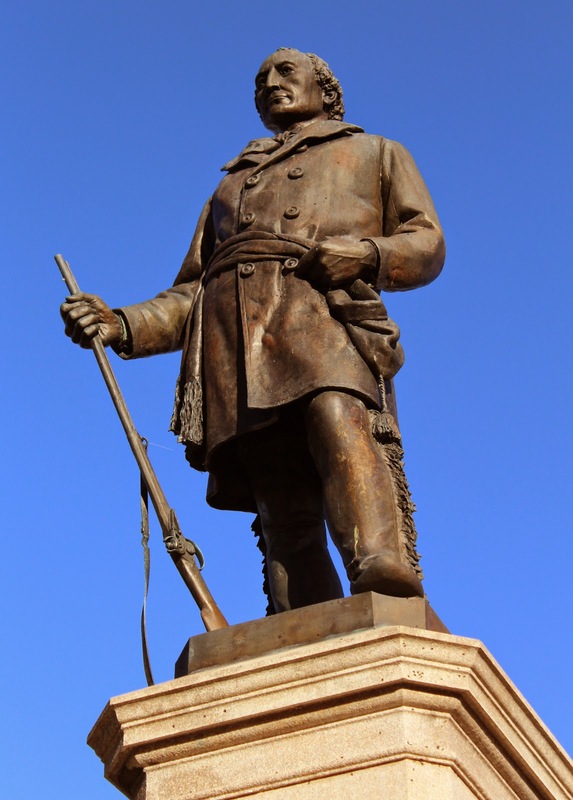 This statue was the gift of shoe manufacturers Charles T. Bradley and William H. Metcalf. Juneau's granddaughter Hattie White unveiled the statue on July 6, 1887. Artist Richard Henry Park created the sculpture. Looking south along Oak Leaf Trial towards the statue. View from Veterans Park (the statue is visible in the center of the photo). 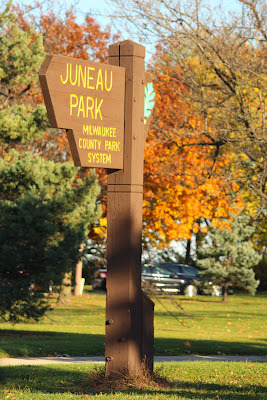 The statue is located at Juneau Park.